A city is one of the units of local government in the Philippines. All Philippine cities are chartered cities (Tagalog: nakakartang lungsod), whose existence as corporate and administrative entities is governed by their own specific municipal charters in addition to the Local Government Code of 1991, which specifies their administrative structure and powers. As of December 12, 2015, there were 145 cities. A city is entitled to at least one representative in the Philippine House of Representatives if its population reaches 250,000. Cities are allowed to use a common seal. As corporate entities, cities have the power to take, purchase, receive, hold, lease, convey, and dispose of real and personal property for its general interests, condemn private property for public use (eminent domain), contract and be contracted with, sue and exercise all the powers conferred to it by Congress. Only an Act of Congress can create or amend a city charter, and with this city charter Congress confers on a city certain powers that regular municipalities or even other cities may not have. Despite the differences in the powers accorded to each city, all cities regardless of status are given a bigger share of the Internal Revenue Allotment (IRA) compared to regular municipalities, as well as being generally more autonomous than regular municipalities. A city's local government is headed by a mayor elected by popular vote. The vice mayor serves as the presiding officer of the Sangguniang Panlungsod (city council), which serves as the city's legislative body. Upon receiving their charters, cities also receive a full complement of executive departments to better serve their constituents. Some departments are established on a case-by-case basis, depending on the needs of the city. Source: Local Government Code of 1991. Cities, like municipalities, are composed of barangays, which can range from urban neighborhoods (such as Brgy. 9, Santa Angela in Laoag), to rural communities (such as Brgy. Iwahig in Puerto Princesa). Barangays are sometimes grouped into officially defined administrative (geographical) districts. Examples of such are the cities of Manila (16 districts), Davao (11 districts), Iloilo (seven districts), and Samal (three districts: Babak, Kaputian and Peñaplata). Some cities such as Caloocan, Manila and Pasay even have an intermediate level between the district and barangay levels, called a zone. However, geographic districts and zones are not political units; there are no elected city government officials in these city-specific administrative levels. Rather they only serve to make city planning, statistics-gathering other administrative tasks easier and more convenient. Highly Urbanized Cities (HUC): Cities with a minimum population of two hundred thousand (200,000) inhabitants, as certified by the Philippine Statistics Authority, and with the latest annual income of at least fifty million pesos (₱50,000,000) based on 1991 constant prices, as certified by the city treasurer. There are currently 33 highly urbanized cities in the Philippines, 16 of which are located in Metro Manila. Independent Component Cities (ICC): Cities of this type have charters that explicitly prohibit their residents from voting for provincial officials. All five of them are considered independent from the province in which they are geographically located: Cotabato, Dagupan, Naga, Ormoc and Santiago. Component Cities (CC): Cities which do not meet the preceding requirements are deemed part of the province in which they are geographically located. If a component city is located along the boundaries of two or more provinces, it shall be considered part of the province of which it used to be a municipality. All but five of the remaining cities are considered component cities. the President of the Philippines exercises direct supervising authority over the city government (given that the provincial government no longer exercises supervision over city officials), as stated in Section 29 of the Local Government Code. Registered voters of the cities of Cotabato, Ormoc, Santiago, as well as all other highly urbanized cities, including those to be converted or created in the future, are not eligible to participate in provincial elections. Some independent cities still serve as the seat of government for the province in which they are geographically located: Bacolod (Negros Occidental), Cagayan de Oro (Misamis Oriental), Cebu City (Cebu), Iloilo City (Iloilo), Lucena (Quezon), Puerto Princesa (Palawan) and Tacloban (Leyte). In such cases, the provincial government, apart from already financing the maintenance of its properties such as provincial government buildings and offices, may also provide the government of the independent city with an annual budget (determined by the province at its discretion) to aid in relieving incidental costs incurred by the city such as road maintenance due to increased vehicular traffic in the vicinity of the provincial government complex. Some independent cities are still grouped with their former provinces for the purposes of representation in Congress. While 24 independent cities have their own representative(s) in Congress, some remain part of the congressional representation of the province to which they formerly belonged: Butuan, for example, is still part of the 1st Congressional District of Agusan del Norte. In cases like this, independent cities that do not vote for provincial officials are excluded from Sangguniang Panlalawigan (provincial council) districts, and the allotment of SP members is adjusted accordingly by COMELEC with proper consideration of population. For example, Agusan del Norte (being a third income-class province) is entitled to elect eight members to its Sangguniang Panlalawigan, and belongs to two congressional districts. The seats of the Sangguniang Panlalawigan are not evenly distributed (4-4) between the province's first and second congressional districts because its 1st Congressional district contains Butuan, an independent city which does not vote for provincial officials. Rather, the seats are distributed 1-7 to account for the small population of the province's 1st Sangguniang Panlalawigan district (consisting only of Las Nieves) and the bulk of the province's population being in the second district. On the other hand, the city of Lucena, which is eligible to vote for provincial officials, still forms part of the province of Quezon's 2nd Sangguniang Panlalawigan district, which is coterminous with the 2nd congressional district of Quezon. General lack of distinction for independent cities, for practical purposes: Many government agencies, as well as Philippine society in general, still continue to classify many independent cities outside Metro Manila as part of provinces due to historical and cultural ties, especially if these cities were once or currently socio-economic and cultural capitals of the provinces to which they once belonged. Furthermore, most maps of the Philippines showing provincial boundaries almost always never separate independent cities from the provinces in which they are geographically located, for cartographic convenience. Despite being first-level administrative divisions (i.e., on the same level as provinces, as stated in Section 25 of the LGC), independent cities are still treated by many to be on the same level as municipalities and component cities (second-level administrative divisions) for educational convenience and simplicity. Some component cities form their own congressional representation, separate from their province. The representation of a city in the House of Representatives (or lack thereof) is not a criterion for independence from a province, as Congress is the national legislative body and is part of the national (central) government. Despite Antipolo, Biñan and San Jose del Monte having their own representatives in Congress, they are still component cities of Rizal, Laguna, and Bulacan, respectively, as their respective charters specifically converted them into component cities and have no provision stating a severance in relations with their respective provincial governments. Being part of an administrative region different from the province: Isabela City functions as a component city of Basilan: its tax revenues are shared with the provincial government, its residents are eligible to both vote and run for provincial offices, and it is served by the provincial government and the Sangguniang Panlalawigan of Basilan with regard to provincially devolved services. However, by opting out of joining the Autonomous Region in Muslim Mindanao (ARMM), Isabela City's residents are ineligible to vote and run for regional offices of the ARMM Regional Legislative Assembly, unlike the rest of Basilan. Regional services provided to Isabela City come from offices in Region IX based in Pagadian; the rest of Basilan is serviced by the ARMM based in Cotabato City. Isabela City, while not independent from its province, is this outside the jurisdiction of the ARMM, the region to which the rest of Basilan belongs. Regions are not the primary subnational administrative divisions of the Philippines, but rather the provinces. a population of at least 150,000, as certified by the Philippine Statistics Authority (PSA); OR a contiguous territory of 100 square kilometers, as certified by the Land Management Bureau, with contiguity not being a requisite for areas that are on two or more islands. Members of Congress (usually the involving representative of the congressional district to which the proposed city belongs) then draft the legislation that will convert or create the city. After the bill passes through both the House of Representatives and the Senate and becomes an Act of Congress, the President signs the Act into law. If the Act goes unsigned after 30 days it still becomes law despite the absence of the President's signature. The creation of cities before 1983 was solely at the discretion of the national legislature; there were no requirements for achieving 'city' status other than an approved city charter. No income, population or land area requirements had to be met in order to incorporate cities before Batas Pambansa Bilang 337 (Local Government Code of 1983) became law. This is what made it possible for several current cities such as Tangub or Canlaon to be conferred such a status despite their small population and locally generated income, which do not meet current standards. The relatively low income standard between 1992 and 2001 (which was ₱20 million) also allowed several municipalities, such as Sipalay and Muñoz, to become cities despite not being able to meet the current ₱100 million local income standard. Before 1987, many cities were created without any plebiscites conducted for the residents to ratify the city charter, most notable of which were cities that were incorporated during the early American colonial period (Manila and Baguio), and during the Commonwealth Era (1935–1946) such as Cavite City, Dansalan (now Marawi), Iloilo City, Bacolod, San Pablo and Zamboanga City. Only since 1987 has it been mandated under the Constitution that any change to the legal status of any local government unit requires the ratification by the residents that would be affected by such changes. Therefore, all cities created after 1987 – after meeting the requirements for cityhood as laid out in the Local Government Code of 1991 and Republic Act No. 9009 of 2001 – only acquired their corporate status after the majority of their voting residents approved their respective charters. Although some early cities were given charters because of their advantageous (Baguio, Tagaytay) or strategic (Angeles and Olongapo, Cotabato, Zamboanga) locations or in order to especially establish new government centers in otherwise sparsely populated areas (Palayan, Trece Martires, Quezon City), most Philippine cities were originally incorporated to provide a form of localized civil government to an area that is primarily urban, which, due to its compact nature and different demography and local economy, cannot be necessarily handled more efficiently by more rural-oriented provincial and municipal governments. However, not all cities are purely areas of dense urban settlement. To date there are still cities with huge expanses of rural or wilderness areas and considerable non-urban populations, such as Calbayog, Davao, Puerto Princesa and Zamboanga as they were deliberately incorporated with increased future resource needs and urban expansion, as well as strategic considerations, in mind. With the enactment of the 1991 Local Government Code, municipalities and cities have both become more empowered to deal with local issues. Regular municipalities now share many of the same powers and responsibilities as chartered cities, but its citizens and/or leaders may feel that it might be to their best interest to get a larger share of internal revenue allotment (IRA) and acquire additional powers by becoming a city, especially if the population has greatly increased and local economy has become more robust. On the other hand, due to the higher property taxes that would be imposed after cityhood, many citizens have become wary of their town's conversion into a city, even if the municipality had already achieved a high degree of urbanization and has an annual income that already exceeds that of many existing lower-income cities. This has been among the cases made against the cityhood bids of many high-income and populous municipalities surrounding Metro Manila, most notably Bacoor and Dasmariñas (which finally became cities in June 2012 and November 2009 respectively), which for many years have been more qualified to become cities than others. In response to the rapid increase in the number of municipalities being converted into cities since the enactment of the Local Government Code in 1991, Senator Aquilino Pimentel authored what became Republic Act No. 9009 in June 2001 which sought to establish a more appropriate benchmark by which municipalities that wished to become cities were to be measured. The income requirement was increased sharply from ₱20 million to ₱100 million in a bid to curb the spate of conversions into cities of municipalities that were perceived to have not become urbanized or economically developed enough to be able to properly function as a city. Throughout the years there have been instances of changes to the city's status with regard to eligibility for provincial elections, as a result of the passage of laws, both of general effectivity and specific to a city. Prior to 1979, all cities were just considered chartered cities, without any official category differentiating them aside from income levels. Though chartered cities were considered autonomous from the provinces from which they were created, the eligibility of their residents to vote for provincial officials was determined by their respective charters. 3) and those which are silent regarding voter participation in provincial elections. The 1951 Supreme Court decision on Teves, et al. v. Commission on Elections finally resolved the ambiguity surrounding the third category of cities, by confirming that the residents of cities with such charters (such as Dumaguete and Davao City) are ineligible to participate in provincial elections. 1940 August 22: Section 7 of the revised charter of the city of Iloilo (Commonwealth Act No. 158) was amended in 1940 by Commonwealth Act No. 604 to explicitly state: "The voters of said City of Iloilo shall take part in the election of the provincial officers of Iloilo, but the latter shall have no jurisdiction over the City of Iloilo and the officers thereof." 1950 June 10: The original city charter of Dagupan (Republic Act No. 170) was originally silent on the matter of the eligibility of city residents to participate in provincial election, therefore implying that residents were ineligible to participate in provincial elections. Three years later Republic Act No. 448 amended the charter to explicitly empower the city's voters to participate in the election of the governor and provincial board members of Pangasinan. 1956 June 14: The city of Cabanatuan was originally explicitly excluded from electing and being elected into positions in the provincial government of Nueva Ecija until its original city charter (Republic Act No. 526) was amended by Republic Act No. 1445 in 1956, which enabled the city's residents to once more vote for provincial officials. 1956 June 16: The original city charter of Dansalan (Commonwealth Act No. 592) was originally silent on the matter of the eligibility of city residents to participate in provincial election, therefore implying that residents were ineligible to participate in provincial elections. Sixteen years later Republic Act No. 1552, in addition to renaming the city to Marawi, also amended the city charter to explicitly empower the city's voters to participate in the election of Lanao Province officials. 1964 June 10: Cebu City's old charter (Commonwealth Act No. 58) was repealed, and replaced with Republic Act No. 3857 in 1964. The law allowed the city's residents to once more become eligible to vote for officials in the provincial government of Cebu. 1969 June 21: Following the Supreme Court decision on Teves, et al. v. Commission on Elections which upheld Dumaguete's independence from Negros Oriental, Republic Act No. 5797 was enacted on June 21, 1969 by Congress to revise the city's original charter (Republic Act No. 327) to explicitly allow the city's residents to once again vote for provincial officials. 1959 June 19: By virtue of Section 2 of Republic Act No. 2259, the voters of the cities of Dagupan and Iloilo were deprived of the right to participate in provincial elections. Batas Pambansa Bilang 51, approved on December 22, 1979, introduced two legal categories of cities: highly urbanized cities (HUCs) and component cities. COMELEC Resolution No. 1421, which was issued to implement the provisions of BP 51 prior to the January 30, 1980 local elections, stated that a total of 20 cities were not allowed to participate in the election of provincial officials: seven of these were "highly urbanized," while the remaining 13 were "component" cities. When Batas Pambansa Bilang 51 came into effect for the January 30, 1980 elections, all cities whose incomes at the time were ₱40 million or higher were considered highly urbanized cities. Cities that met this income requirement at the time were: Caloocan, Cebu, Davao, Manila, Pasay and Quezon City. Regardless of whether their respective charters allowed them to vote for provincial officials or not, highly urbanized cities were no longer allowed to vote for provincial officials. Among the aforementioned, only the voters of Cebu City lost the right to participate in provincial elections in this manner; the voters of the other five cities have not participated in any provincial election since their respective incorporation as cities. In addition, Section 3 of BP 51 also made Baguio a highly urbanized city irrespective of its income, due to its importance as the host to the official summer residences of the President and the Supreme Court. A Supreme Court case decided two days before election day upheld the legality of BP 51 in depriving the voters of Cebu City the power to elect officials for the province of Cebu. Per Section 3 of BP 51, all other cities were considered "component cities" of the provinces in which they are geographically located, or the provinces of which they were originally a part. Despite considering all other cities as part of their respective provinces, under BP 51 the eligibility of voters to participate in provincial elections were still determined by their cities' respective charters (as amended). The voters of a total of thirteen "component cities" continued to be ineligible to vote for provincial officials for the local elections of 1980. Nine of these were cities with charters (as amended) that expressly prohibited participation in provincial elections: Dagupan, General Santos, Iloilo, Mandaue, Naga, Ormoc, Oroquieta, San Carlos (Pangasinan) and Zamboanga. The remaining four — Bais, Canlaon, Cotabato and Ozamiz — were cities whose charters were silent on participation in provincial elections; BP 51 upheld the 1951 Supreme Court decision on Teves, et al. v. Commission on Elections by barring their residents from participating in the election of provincial officials. Batas Pambansa Bilang 337 (Local Government Code of 1983), approved on February 10, 1983, further refined the criteria by which cities can be classified as highly urbanized cities. Under BP 337 a city that had at least 150,000 inhabitants and an income of at least ₱30 million was to be declared highly urbanized by the Minister of Local Government within thirty days of the city having met the requirement. The cities of Angeles (1986), Bacolod (September 27, 1984), Butuan (February 7, 1985), Cagayan de Oro (November 22, 1983), Iloilo (1983) Iligan (November 22, 1983), Olongapo (December 7, 1983), and Zamboanga (November 22, 1983) became HUCs in this manner. The residents in most of these cities lost their right to participate in provincial elections for the first time. The two exceptions are: Iloilo City, which had already been deprived of the right to vote for provincial officials in 1959 by virtue of Section 2 of RA 2259, and Zamboanga City, which had been autonomously governed since its creation by virtue of Section 47 of its city charter (Commonwealth Act No. 39). By virtue of Section 30 of Batas Pambansa Bilang 881 (Omnibus Election Code of the Philippines), approved on December 3, 1985, provided that: "unless their respective charters provide otherwise, the electorate of component cities shall be entitled to vote in the election for provincial officials of the province of which it is a part." This provision therefore overrides the 1951 Supreme Court decision on Teves, et al. v. Commission on Elections by providing voters in component cities whose charters are silent on the matter of electing provincial officials the right to again participate in provincial elections. BP 881 therefore again enfranchised voters in the cities of Bais and Canlaon (Negros Oriental), and Ozamiz (Misamis Occidental). Despite the charter of the city of Cotabato being silent on the matter of electing provincial officials, the city was not legislated to be part of any of the successor provinces of the old undivided Cotabato province. Voters of the city therefore were still not eligible to vote in the provincial elections of either Maguindanao or North Cotabato and therefore remained independent from any province. The period between ratification of the new Constitution (February 1987) and the effectivity of the Local Government Code of 1991 (January 1992) was one of transition. During this time, BP 51, BP 337 and BP 881 were still in force: the only legal classes of cities during this period were still "highly urbanized" and "component" cities. Altering the right of city residents to participate in provincial elections was once again exercised by the newly restored Congress in this period. A total of three cities were affected: Republic Acts No. 6641 (in 1987), 6726 (in 1989) and 6843 (in 1990), once again allowed the residents of Mandaue, Oroquieta and San Carlos to vote for provincial officials of Cebu, Misamis Occidental and Pangasinan respectively. Since BP 51—which only considered cities as being either "highly urbanized" or "component"—was still in force at the time, the changes were not considered as switching between legal categories, but rather a simple change within the "component city" classification that did not require a plebiscite. Note that the "independent component city" legal classification was only introduced through the Local Government Code in 1992. Under the same criteria set in BP 337 (Local Government Code of 1983), a total of three cities became highly urbanized: General Santos (September 5, 1988), Lucena (July 1, 1991) and Mandaue (February 15, 1991). Lucena and Mandaue were special cases, in that because their re-classification into HUC status took place after the ratification of the Constitution (February 11, 1987) but before the effectivity of the Local Government Code of 1991 (January 1, 1992), their residents were allowed to continue to participate in the election of provincial officials as per their respective charters (as amended), by virtue of Sec. 452-c of the LGC. Residents of General Santos were already excluded from voting for provincial officials of South Cotabato since achieving cityhood in 1968; they were therefore unaffected by this exemption. The Local Government Code of 1991 came into effect on January 1, 1992, and has remained in force ever since, though some amendments have been made. New requirements for creating cities, and upgrading cities to highly urbanized status, were instituted under this Act. The LGC of 1991 was also the first time the independent component city (ICC) category was introduced. These cities are those non-highly urbanized cities whose charters explicitly prohibited city residents to vote in provincial elections. They were finally made completely independent of the province from fiscal, administrative and legal standpoints. The municipalities of Metro Manila, having been severed from the provinces of Bulacan and Rizal and made independent units in 1975, were converted to highly urbanized cities, beginning in 1994 with Mandaluyong. The most recent, Navotas, became an HUC in 2007. Only Pateros, which does not currently meet the population requirement of 200,000 inhabitants, remains the only independent municipality in Metro Manila. All that is needed is a congressional amendment to a component city's charter, prohibiting city residents to vote for provincial officials. So far no city has been upgraded this way. Since 1992, once a city reaches a population of 200,000 persons as certified by the Philippine Statistics Authority and an income of ₱50 million (based on 1991 constant prices) as certified by the city treasurer, the city government can submit a request to the President to have their city declared as highly urbanized within 30 days. Upon the President's declaration, a plebiscite will be held within a specific timeframe to ratify this conversion. There are no limits as to the number of times a component city can attempt to become a highly urbanized city, should previous tries be unsuccessful. Puerto Princesa (2007): Proclamation No. 1264 signed on March 26, 2007 declared the capital city of Palawan an HUC. Majority of the votes cast in a plebiscite held on July 21, 2007 approved the conversion. Lapu-Lapu (2007): Proclamation No. 1222 signed on January 23, 2007 declared the component city of Lapu-Lapu an HUC. Majority of the votes cast in a plebiscite held on July 21, 2007 approved the conversion. Tacloban (2008): Proclamation No. 1637 signed on October 4, 2008 declared the capital city of Leyte an HUC. Majority of the votes cast in a plebiscite held on December 18, 2008 approved the conversion. Cabanatuan, Nueva Ecija (1997): Proclamation No. 969 signed on February 13, 1997 declared the former capital of the province of Nueva Ecija an HUC. Majority of the votes cast in a plebiscite held simultaneously with the barangay elections on May 12, 1997 did not approve the conversion. Tarlac, Tarlac (2005): Proclamation No. 940 signed on October 27, 2005 declared the capital city of the province of Tarlac an HUC. Majority of the votes cast in a plebiscite held on February 11, 2006 did not approve the conversion. Antipolo, Rizal (2011): Proclamation No. 124 signed on March 14, 2011 declared the capital city of the province of Rizal an HUC. On April 4, 2011, Antipolo's city mayor announced that the planned June 18, 2011 plebiscite is indefinitely postponed, effectively suspending the bid to convert the city into an HUC. Cabanatuan, Nueva Ecija (2012): Proclamation No. 418 signed on July 4, 2012 once again declared the former capital of the province of Nueva Ecija an HUC. The plebiscite was originally set for December 1, 2012, but, due to preparations for the upcoming 2013 national, ARMM and local elections, was rescheduled by COMELEC for January 25, 2014. A week before the rescheduled plebiscite, the Supreme Court issued a temporary restraining order, which postponed the vote until the case brought by Nueva Ecija governor Aurelio Umali was decided. On April 22, 2014 the Supreme Court ordered COMELEC to include the rest of Nueva Ecija in the plebiscite, given that the province's income will be significantly affected once Cabanatuan attains autonomy as an HUC. COMELEC subsequently rescheduled the expanded plebiscite for November 8, 2014. However, on October 21 COMELEC issued Minute Resolution No. 14-0732, which suspended the voting until the city government of Cabanatuan provides the ₱101 million needed to administer the expanded plebiscite. Reclassifying an HUC as a component city likely involves not only amending the concerned city's charter, but also the Local Government Code, as currently there is no provision in the LGC that allows this, nor are there any precedents. Some Cebu City politicians have previously indicated that they wish to bring back the city under the province's control, in order to bring in more votes against the Sugbuak, the proposed partition of Cebu Province. A congressional amendment to the city charter enabling city residents to vote for provincial officials is required, followed by a plebiscite. Santiago's status as an independent component city was briefly in question after the enactment of Republic Act No. 8528 on February 14, 1998 which sought to make it a regular component city. The Supreme Court on September 16, 1999 however ruled in favor of the city's mayor who contended that such a change in the status of the city required a plebiscite just like any other merger, division, abolition or alteration in boundaries of any political unit. And due to the lack of a plebiscite to affirm such a change, RA 8528 was therefore unconstitutional. The League of Cities of the Philippines (LCP) is a non-profit organization and is not a government agency. It has a membership of 143 cities and was founded in 1988. The organization was formed to help coordinate efforts to improve governance and local autonomy and to tackle issues such as preserving the environment and improving public works. As of December 12, 2015[update], there are 145 cities in the Philippines. General Trias in Cavite is the newest city, after its charter was ratified on December 12, 2015. For a more comprehensive list, see List of Philippine cities and municipalities by population. Quezon City 2,936,116 Former capital of the country (1948–1976). Largest city in Metro Manila in population and land area. Hosts the House of Representatives of the Philippines at the Batasang Pambansa Complex and the metropolis' largest source of water, the La Mesa Reservoir. Manila 1,780,148 Capital of the country (1571–1948 and 1976–present). Historically centered on the walled city of Intramuros, by the mouth of the Pasig River. Host to the seat of the chief executive, the Malacañang Palace. By far the most densely populated city in the country, as well as the whole world. Davao City 1,632,588 The largest city in Mindanao by population. Historically centered near where the Davao River exits into the Davao Gulf, the city also encompasses expanses of wilderness, including part of the Mount Apo Natural Park, making it the largest city in the Philippines by land area. Regional center of the Region XI, and core of the third-largest metropolitan area in the country, Metro Davao. Historic city where Andrés Bonifacio and the Katipunan held many of its meetings in secrecy. Much of its territory was ceded to form Quezon City, resulting in the formation of two non-contiguous sections under the city's jurisdiction. The city mainly encompasses residential areas, with significant industrial and commercial sections. Popularly nicknamed "The Queen City of the South". Site of the first Spanish settlement in the country. Capital of the province of Cebu and regional center of Region VII. Most populous city in the Visayas and core of the country's second-largest metropolitan area, Metro Cebu. Zamboanga City 861,799 Nicknamed "City of Flowers" and marketed by its city government as "Asia's Latin City" for its substantial Spanish-derived Creole-speaking population. Former capital of the Moro Province and of the undivided province of Zamboanga. Former regional center of the Zamboanga Peninsula administrative region, but remains the largest city in western Mindanao. Taguig 804,915[i] Lying on the western shore of Laguna de Bay, the city encompasses significant industrial, commercial and residential areas, including the disputed area of Fort Bonifacio, a former American military base that has been in development as the country's new premier business district. Was part of Rizal Province until 1975, when it was incorporated into Metro Manila. Antipolo 776,386 Nicknamed "City in the Sky" for its location on the hills immediately east of Metro Manila. Well-known pilgrimage and tourist center, being host to a Marian shrine and the Hinulugang Taktak National Park. Most populous component city in the country, and comprises more than a quarter of the total population of the province of Rizal and the capital of that province. Pasig 755,300 Hosts most of the Ortigas Center, one of Metro Manila's prime business districts. Located where Laguna de Bay empties into the Pasig River. Part of the province of Rizal until 1975, when it was incorporated into Metro Manila. Formerly hosted the capitol and other government buildings of that province. Cagayan de Oro 675,950 Nicknamed the "City of Golden Friendship" and formerly known as Cagayan de Misamis. Located at the mouth of the swift-flowing Cagayan de Oro River, which has become a tourist draw. Regional center of Northern Mindanao and capital of the province of Misamis Oriental. ^ Population figure for Taguig excludes disputed barangays with Makati City. 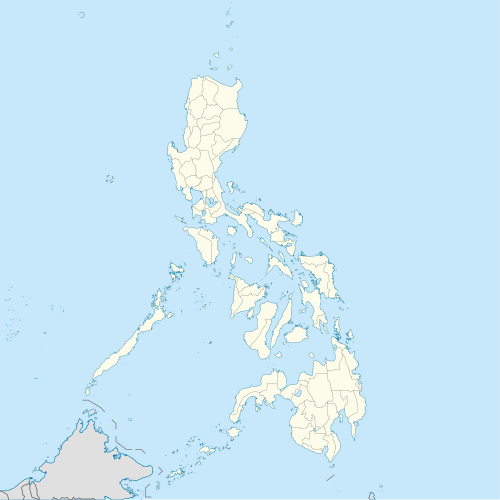 Largest: Davao City, with an area of 2,433.61 square kilometres (939.62 sq mi). However, some sources claim that Puerto Princesa covers an area of more than 2,500 square kilometres (970 sq mi), its officially recognized land area figure (according to IRA share calculation data) is 2,381.02 square kilometres (919.32 sq mi). Contrary to popular belief within the Philippines, Davao City does not hold the record of being the world's largest city in terms of land area. Lowest: Most Philippine cities are located on sea level. However, some parts of Navotas, South Caloocan and Malabon are below sea level, and continue to experience subsidence. Highest: much of Baguio is situated more than 1,300 metres (4,300 ft) above sea level. However, the peak of Mount Apo, the tallest mountain in the Philippines, forms part of Davao City's boundary with the municipality of Bansalan, Davao del Sur; the city of Digos encompasses a section of the Mount Apo Natural Park as well. Legazpi City (1948–1954): Legazpi's cityhood was approved on June 18, 1948. Under Republic Act No. 306, Legazpi became a city after the President of the Philippines proclaimed its cityhood. Comprising the present-day territories of Legazpi City and Daraga, the city was dissolved on June 8, 1954 when Legazpi and Daraga were made into separate municipalities. Legazpi eventually became a city on its own on June 12, 1959. Basilan City (1948–1973): Formerly part of the city of Zamboanga until it was made a city on its own in 1948 through Republic Act No. 288. Delimited to only the downtown area of what is now Isabela City upon the creation of the province of Basilan in 1973 through Presidential Decree No. 356 by President Ferdinand Marcos. Finally abolished and its territory annexed to the municipality of Isabela on November 7, 1975 through Presidential Decree No. 840. Rajah Buayan City (1966): Under Republic Act No. 4413, the then-municipality of General Santos in what was then the unified province of Cotabato was to be formally converted into a city named after a historical ruler in Mindanao on January 1, 1966, provided that majority of qualified voters in the municipality vote in favor of cityhood in a plebiscite. In December 1965 the Commission on Elections (COMELEC) proclaimed the cityhood of Rajah Buayan, with 4,422 people voting for and 3,066 voting against. However, two residents of the new city challenged this by arguing in the courts that the number of people who voted in favor of cityhood did not form a majority in light of the fact that there were 15,727 voters in the city. The court issued an injunction on January 4, 1966 restraining city officers from performing any acts authorized by or pursuant to provisions in RA 4413. The Supreme Court unanimously upheld this decision on October 29, 1966 and declared that the city charter was not accepted by majority of voters, thus rendering RA 4413 null and void. The municipality of General Santos would later be converted into a city under the same name in 1968. The Court held that the foregoing Cityhood Laws, all enacted after RA 9009's effectivity, "explicitly exempt respondent municipalities from the increased income requirement from ₱20 million to ₱100 million in Sec. 450 of the Local Government Code (LGC), as amended by RA 9009. Such exemption clearly violates Section 10, Article X of the Constitution and is thus patently unconstitutional. To be valid, such exemption must be written in the Local Government Code and not in any other law, including the Cityhood Laws." However, more than a year later, on December 22, 2009, acting on the appeal of the so-called League of 16 Cities (an informal group consisting of the sixteen local government units whose cityhood status had been reversed), the Supreme Court reversed its earlier ruling as it ruled that "at the end of the day, the passage of the amendatory law (regarding the criteria for cityhood as set by Congress) is no different from the enactment of a law, i.e., the cityhood laws specifically exempting a particular political subdivision from the criteria earlier mentioned. Congress, in enacting the exempting law/s, effectively decreased the already codified indicators." As such, the cityhood status of the said 16 LGUs was effectively restored. In August 24, 2010. In a 16-page resolution, the Supreme Court reinstated its November 18, 2008 decision striking down the cityhood laws, reducing once more the sixteen LGUs to the status of regular municipalities. The most recent development in the legal battles surrounding the League of 16 came on February 15, 2011. Voting 7-6, the Supreme Court (SC) ruled that 16 towns that became cities in 2007 can stay as cities. It's the fourth time the SC has ruled on the case, and the third reversal. It said the conversion of the 16 towns into cities met all legal requirements. Note: This section only lists attempts that reached the stage where a Republic Act was enacted for the purpose of achieving cityhood. Batangas (1965): A majority of the votes cast in the then-municipality of Batangas rejected cityhood in a plebiscite conducted on the same day as the 1965 Philippine general elections, as mandated by Republic Act No. 4586. The city would have been named Laurel City in honor of Jose P. Laurel, the president of the Japanese-sponsored Second Republic. The municipality of Batangas would later be converted into a city under the same name in 1969. Tarlac (1969): The city charter of Tarlac (Republic Act No. 5907) was approved on June 21, 1969. Cityhood was rejected in a plebiscite held on November 11, 1969 by a majority of the ballots cast. Tarlac became a city 29 years after, in 1998. Ilagan (1999): Republic Act No. 8474, which converted Ilagan to a component city of Isabela, was approved on February 2, 1998. However, majority of votes cast in the plebiscite held on March 14, 1999 rejected cityhood. Ilagan finally became a city after majority of votes cast in the August 11, 2012 plebiscite approved. Novaliches (1999): On February 23, 1998 the controversial City Charter of Novaliches (Republic Act No. 8535) was approved, which sought to create a new city out of the 15 northern barangays of Quezon City. Historically a separate town, Novaliches was distributed between Quezon City and northern Caloocan in 1948. In a plebiscite held on October 23, 1999, the majority of ballots cast (which included all voters of Quezon City and not just the 15 barangays) rejected the cityhood of Novaliches. Meycauayan (2001): Cityhood was rejected by majority of the votes cast in a plebiscite held on March 30, 2001 to ratify Republic Act No. 9021. Meycauayan became a city five years later with the enactment of Republic Act No. 9356 and its ratification through a plebiscite on December 10, 2006. For a more comprehensive list, see List of renamed cities and municipalities in the Philippines. Note: This section only lists name changes made upon or since cityhood. Cagayan de Oro: The municipality of Cagayan de Misamis was converted to the city of Cagayan de Oro in 1950 through Republic Act No. 521. Lapu-Lapu: The municipality of Opon was converted to a city named after Lapu-Lapu, hero of the Battle of Mactan in 1961 through Republic Act No. 3134. Marawi: Inaugurated as the City of Dansalan in 1950, renamed to Marawi on June 16, 1956 through Republic Act No. 1552. Ozamiz: The municipality of Misamis was converted to a city named after José Ozámiz, the first governor of Misamis Occidental, in 1948 through Republic Act No. 321. Pasay: Inaugurated as Rizal City in 1947, reverted to Pasay on June 7, 1950 through Republic Act No. 437. Roxas: In 1951, the municipality of Capiz was converted to a city named after Manuel Roxas, the first president of the Third Philippine Republic and town native through Republic Act No. 603. ^ a b "General Trias in Cavite now a city". Rappler. 13 December 2015. Retrieved 13 December 2015. ^ a b c d e f g h "Republic Act No. 7160 - An Act Providing for a Local Government Code of 1991". The LawPhil Project. Metro Manila, Philippines. 10 October 1991. Retrieved 30 April 2016. ^ "Department Order No. 23-08" (PDF). Philippine Statistics Authority. 29 July 2008. Archived from the original (PDF) on 18 December 2014. Retrieved 29 April 2016. ^ "Republic Act No. 9009 - An Act Amending Sec. 450 of Republic Act No. 7160, Otherwise Known as the Local Government Code of 1991, by Increasing the Average Annual Income Requirement for a Municipality or Cluster of Barangays to be Converted into a Component City". Chan Robles Virtual Law Library. 24 February 2001. Retrieved 29 April 2016. ^ a b "A Call for Reason and Respect for Law". LCP Policy Blog. Retrieved 29 April 2016. ^ "League of Cities wants veto on city hood of 12 towns". The Manila Times. 9 February 2007. Archived from the original on 22 January 2009. Retrieved 29 April 2016. ^ a b c "G.R. No. L-5150; Teves, et al. vs. Commission on Elections". The LawPhil Project. Metro Manila, Philippines. 8 November 1951. Retrieved 30 April 2016. ^ National Assembly of the Philippines (22 August 1940). "Commonwealth Act No. 604 - An Act to Amend Certain Sections of the Charter of the City of Iloilo". The Corpus Juris. Retrieved 28 November 2016. ^ "Republic Act No. 170 - An Act Creating the City of Dagupan". Chan Robles Virtual Law Library. 20 June 1947. Retrieved 28 November 2016. ^ "Republic Act No. 448 - An Act to Amend the Charter of the City of Cabanatuan". Chan Robles Virtual Law Library. 10 June 1950. Retrieved 28 November 2016. ^ "Republic Act No. 526 - An Act Creating the City of Cabanatuan". Chan Robles Virtual Law Library. 16 June 1950. Retrieved 29 April 2016. ^ "Republic Act No. 1445 - An Act Amending Certain Sections of Republic Act Numbered Five Hundred Twenty-Six, Otherwise Known as the Charter of the City of Cabanatuan". Chan Robles Virtual Law Library. 14 June 1956. Retrieved 29 April 2016. ^ National Assembly of the Philippines (19 August 1940). "Commonwealth Act No. 592 - An Act to Create the City of Dansalan". Chan Robles Law Library. Retrieved 18 February 2017. ^ Congress of the Philippines (16 June 1956). "Republic Act No. 1552 – An Act to Amend the Charter of the City of Dansalan so as to Change Its name to Marawi and Make Elective Its Mayor, Vice Mayor and Councilors, and for other purposes". Chan Robles Law Library. Retrieved 18 February 2017. ^ "Commonwealth Act No. 58 - An Act Creating the City of Cebu". Chan Robles Virtual Law Library. 20 October 1934. Retrieved 28 November 2016. ^ "Republic Act No. 3857 - An Act to Revise the Charter of the City of Cebu". The LawPhil Project. 10 June 1964. Retrieved 28 November 2016. ^ Congress of the Philippines (15 July 1948). "Republic Act No. 327 - An Act Creating the City of Dumaguete". Chan Robles Virtual Law Library. Retrieved 28 November 2016. ^ Congress of the Philippines (21 June 1969). "Republic Act No. 5797 - An Act to Revise the Charter of the City of Dumaguete". The Corpus Juris. Retrieved 10 August 2016. ^ a b Congress of the Philippines (19 June 1959). "Republic Act No. 2259 - An Act making elective the offices of Mayor, Vice Mayor and Councilors in chartered cities, regulating the election in such cities and fixing the salaries and tenure of such offices". The LawPhil Project. Retrieved 29 April 2016. ^ a b c d e "Batas Pambansa Blg. 51 - An Act Providing for the Elective or Appointive Positions in Various Local Governments and for Other Purposes". Chan Robles Virtual Law Library. 22 December 1979. Retrieved 29 April 2016. ^ a b c d e Supreme Court of the Philippines (28 January 1980). "G.R. No. L-52304 - RAMON B. CENIZA, FEDERICO C. CABILAO, JR., NELSON J. ROSAL and ALEJANDRO R. ALINSUG, petitioners, vs. COMMISSION ON ELECTIONS, COMMISSION ON AUDIT, and NATIONAL TREASURER, respondents". The LawPhil Project. Retrieved 9 August 2016. ^ a b "Batas Pambansa Blg. 337 - An Act Enacting a Local Government Code (Repealed by Republic Act No. 7160)". Chan Robles Virtual Law Library. 10 February 1983. Retrieved 29 April 2016. ^ "Commonwealth Act No. 39 - An Act Creating the City of Zamboanga". Chan Robles Virtual Law Library. 12 October 1936. Retrieved 28 November 2016. ^ Batasang Pambansa ng Pilipinas (3 December 1985). "Batas Pambansa Blg. 881 - Omnibus Election Code of the Philippines". The LawPhil Project. Retrieved 11 August 2016. ^ Congress of the Philippines (23 December 1987). "Republic Act No. 6641 - An Act allowing qualified voters of the City of Mandaue to vote in provincial elections of the Province of Cebu, amending for the purpose Republic Act Numbered Fifty-Five Hundred and Nineteen". Archived from the original on 20 August 2016. Retrieved 10 August 2016. ^ "Republic Act No. 6726 - An Act Allowing Qualified Voters of the City of Oroquieta to Vote in Provincial Elections of the Province of Misamis Occidental, Amending for the Purpose Republic Act Numbered Fifty-Five Hundred and Eighteen". Chan Robles Virtual Law Library. 15 May 1989. Retrieved 29 April 2016. ^ "Republic Act No. 6843 - An Act to Amend Section Ninety-Six of Republic Act Numbered Forty-Four Hundred and Eighty-Seven, Entitled "An Act Creating the City of San Carlos in Pangasinan" by Allowing Qualified Voters of the City of San Carlos to Vote in the Provincial Elections of the Province of Pangasinan". Chan Robles Virtual Law Library. 5 January 1990. Retrieved 29 April 2016. ^ a b "Miranda vs. Aguirre : G.R. No. 133064 : September 16, 1999 : J. Puno : En Banc". Supreme Court of the Philippines. 16 September 1999. Retrieved 29 April 2016. ^ Doque IV, Jesus B. (11 March 2011). "DILG Opinion No. 5, S. 2011" (PDF). Retrieved 11 August 2016. ^ Macapagal-Arroyo, Gloria (26 March 2007). "Converting the City of Puerto Princesa from a component city into a highly-urbanized city". Government of the Republic of the Philippines. Archived from the original on 20 August 2016. Retrieved 11 August 2016. ^ a b "PSGC Updates (July - September 2007)". Philippine Statistics Authority. 2007. Archived from the original on 2016-05-08. Retrieved 11 August 2011. ^ Macapagal-Arroyo, Gloria (23 January 2007). "Converting the City of Lapu-Lapu from a component city into a highly-urbanized city". Government of the Republic of the Philippines. Retrieved 11 August 2016. ^ Macapagal-Arroyo, Gloria (4 October 2008). "Converting the City of Tacloban into a highly-urbanized city". Government of the Republic of the Philippines. Retrieved 11 August 2016. ^ "Thirteen Barangays Created; One City Converted to Highly Urbanized City in the 4th Quarter of 2008". Philippine Statistics Authority. 16 February 2008. Retrieved 11 August 2011. ^ Ramos, Fidel V. (13 February 1997). "Converting the City of Cabanatuan from a component city into a highly-urbanized city" (PDF). Government of the Republic of the Philippines. Retrieved 11 August 2016. ^ Macapagal-Arroyo, Gloria (27 October 2005). "Converting the City of Tarlac from a component city into a highly-urbanized city" (PDF). Government of the Republic of the Philippines. Retrieved 11 August 2016. ^ Aquino III, Benigno S. (14 March 2011). "Converting the City of Antipolo from a component city into a highly-urbanized city". Government of the Republic of the Philippines. Retrieved 11 August 2016. ^ "Antipolo City's urbanization put on hold temporarily". Manila Bulletin. 2011-04-06. Archived from the original on 2016-03-05. Retrieved 2015-09-04. ^ Aquino III, Benigno (4 July 2012). "Converting the City of Cabanatuan from a component city into a highly-urbanized city". Government of the Republic of the Philippines. Retrieved 11 August 2016. ^ a b Roque, Elmo (10 February 2015). "'Highly-urbanized' Cabanatuan still unratified". Punto! Central Luzon. Archived from the original on 17 March 2015. Retrieved 11 August 2016. ^ a b c Velasco, Jr., Presbitero J. (22 April 2014). "Aurelio M. Umali v. COMELEC, G.R. No. 203974, 22 April 2014". The LawPhil Project. Supreme Court of the Philippines. Retrieved 11 August 2016. ^ Santos, Jr., Reynaldo (6 November 2014). "Cabanatuan City plebiscite postponed for the 3rd time". Rappler. Retrieved 11 August 2016. ^ "Republic Act No. 8528 - An Act Amending Certain Sections of Republic Act Numbered 7720 - An Act Converting the Municipality of Santiago into an Independent Component City to be Known as the City of Santiago". Chan Robles Virtual Law Library. 14 February 1998. Retrieved 29 April 2016. ^ a b Census of Population (2015). Highlights of the Philippine Population 2015 Census of Population. PSA. Retrieved 20 June 2016. ^ "Cagayan de Oro's White Water Rafting". Philippine Postal Corporation. June 18, 2012. Archived from the original on July 29, 2012. Retrieved September 13, 2012. ^ "PSGC Interactive; List of Cities". Philippine Statistics Authority. Archived from the original on 29 April 2011. Retrieved 30 April 2016. ^ "Puerto Princesa: The Country's Ecotourism Capital". Puertoprincesaboard.com. Archived from the original on 29 September 2008. Retrieved 29 April 2016. The city lies along the mid-section of the long island of the Palawan province. It has a land area totalling 253,982.00 hectares stretching to over 106 kilometers and it has the narrowest breadth which is 8.5 kilometers found in the Barangay Bahile. ^ "CY 2008 Final Internal Revenue Allotment for LGUs" (PDF). Department of Budget and Management. Archived from the original (PDF) on 17 February 2012. Retrieved 29 April 2016. ^ "About Davao - Land Area". The Official Website of the City Government of Davao. 2011. Retrieved 18 February 2017. ^ "Discussion on CAMANAVA control project continues". Congress of the Philippines (Volume 13, No. 36). Source: Committee Administrative Support Service, Committee Affairs Department. 21 February 2005. Archived from the original on 18 May 2013. Retrieved 29 April 2016. 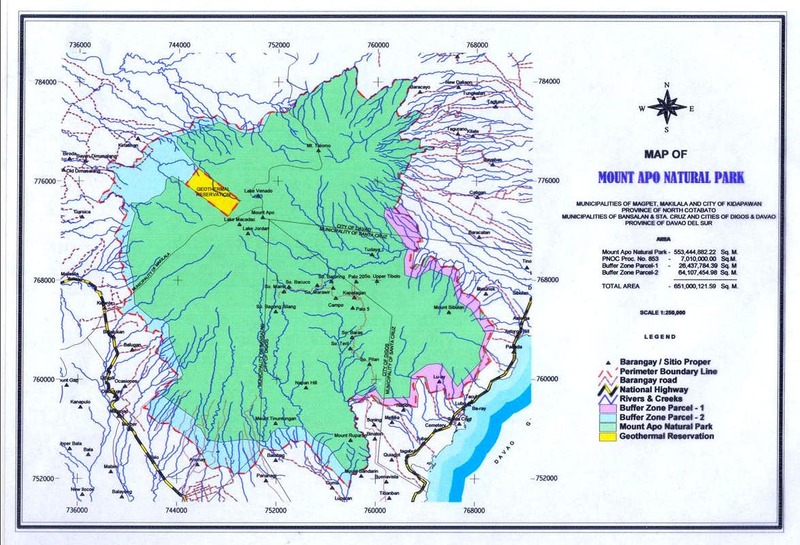 ^ "Map of Mount Apo Natural Park". Summit Post. Retrieved 18 February 2017. ^ "Republic Act No. 306 - An Act Creating the City of Legaspi". Chan Robles Virtual Law Library. 18 June 1948. Retrieved 29 April 2016. ^ "Welcome to My City of Legazpi". Angelfire (undefined). Retrieved 29 April 2016. ^ "Republic Act No. 288 - An Act Creating the City of Basilan". Chan Robles Virtual Law Library. 16 June 1948. Retrieved 29 April 2016. ^ "Presidential Decree No. 356 - Creating the Province of Basilan". Chan Robles Virtual Law Library. 27 December 1973. Retrieved 29 April 2016. ^ "Presidential Decree No. 840 - Reorganizing the political subdivision of the Province of Basilan, converting Basilan City into the Municipality of Isabela, appropriating funds therefor, and for other purposes". Chan Robles Virtual Law Library. 11 December 1975. Retrieved 29 April 2016. ^ "Republic Act No. 4413 - An Act Creating the City of Rajah Buayan". The LawPhil Project. 19 June 1965. Retrieved 29 April 2016. ^ "G.R. No. L-25469". The LawPhil Project. 29 October 1966. Retrieved 29 April 2016. ^ "G.R. No. 176951". Supreme Court of the Philippines. 18 November 2008. Retrieved 29 April 2016. ^ Rempillo, Jay B. (18 November 2008). "SC Voids 16 Cityhood Laws". Court News Flash November 2008. Supreme Court of the Philippines. Archived from the original on 19 March 2009. Retrieved 29 April 2016. ^ Pulta, Benjamin B. (23 December 2009). "SC reverses self, upholds creation of 16 cities". The Daily Tribune. Archived from the original on 8 May 2010. Retrieved 29 April 2016. ^ Rempillo, Jay B. (27 August 2010). "SC Reinstates 2008 Decision Voiding 16 Cityhood Laws". Court News Flash August 2010. Supreme Court of the Philippines. Archived from the original on 18 March 2012. Retrieved 29 April 2016. ^ Dedace, Sophia M. (16 February 2011). "16 towns now cities again as SC reverses itself for 3rd time". GMA News. Archived from the original on 18 February 2011. Retrieved 29 April 2016. ^ "Republic Act No. 4586 - An Act Creating Laurel City". Chan Robles Virtual Law Library. 19 June 1965. Retrieved 29 April 2016. ^ "Republic Act No. 5907 - An Act Creating the City of Tarlac". Chan Robles Virtual Law Library. 21 June 1969. Retrieved 29 April 2016. ^ "Republic Act No. 8474 - An Act Converting the Municipality of Ilagan into a Component City of the Province of Isabela to be Known as the City of Ilagan". Chan Robles Virtual Law Library. 2 February 1998. Retrieved 29 April 2016. ^ "Republic Act No. 10169 - An Act Converting the Municipality of Ilagan in the Province of Isabela into a Component City to be Known as the City of Ilagan" (PDF). Senate of the Philippines. Metro Manila, Philippines. 21 June 2012. Retrieved 29 April 2016. ^ "Republic Act No. 8535 - An Act Creating the City of Novaliches". Chan Robles Virtual Law Library. 23 February 1998. Retrieved 29 April 2016. ^ "Republic Act No. 9021 - An Act Converting the Municipality of Meycauayan, Province of Bulacan into a Component City to be Known as the City of Meycauayan". The LawPhil Project. Metro Manila, Philippines. 5 March 2001. Retrieved 29 April 2016. ^ "Republic Act No. 9356 - An Act Converting the Municipality of Meycauayan in the Province of Bulacan into a Component City to be Known as the City of Meycauayan". The LawPhil Project. Metro Manila, Philippines. 2 October 2006. Retrieved 29 April 2016. ^ Balabo, Dino (12 December 2006). "Bulacan Now Has 3 Cities". NewsFlash.org. STAR. Archived from the original on 7 June 2012. Retrieved 29 April 2016. ^ "Republic Act No. 521 - An Act Creating the City of Cagayan de Oro". Chan Robles Virtual Law Library. 15 June 1950. Retrieved 29 April 2016. ^ "Republic Act No. 3134 - An Act Creating the City of Lapu-Lapu". Chan Robles Virtual Law Library. 17 June 1961. Retrieved 29 April 2016. ^ "Republic Act No. 1552 - An Act to Amend the Charter of the City of Dansalan So as to Change Its Name to Marawi and Make Elective Its Mayor, Vice Mayor and Councilors, and for Other Purposes". Chan Robles Virtual Law Library. 16 June 1956. Retrieved 29 April 2016. ^ "Republic Act No. 321 - An Act Creating the City of Ozamiz". Chan Robles Virtual Law Library. 19 June 1948. Retrieved 29 April 2016. ^ "Republic Act No. 437 - An Act Changing the Name of Rizal City to Pasay City". Chan Robles Virtual Law Library. 7 June 1950. Retrieved 29 April 2016. ^ "Republic Act No. 603 - An Act Creating the City of Roxas". Chan Robles Virtual Law Library. 11 April 1951. Retrieved 29 April 2016. This page was last edited on 6 April 2019, at 11:09 (UTC).